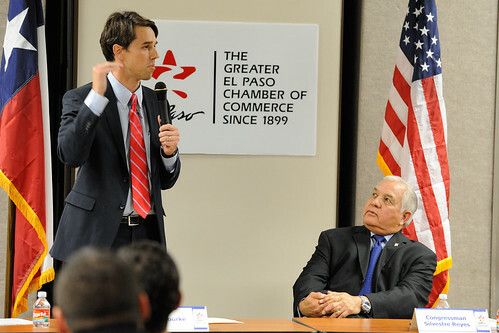 El Paso, Texas - January 11, 2012: Greater El Paso Chamber of Commerce Candidate Forum for Democratic Candidates for the 16th Congressional District of Texas. Beto O’Rourke is a 2012 Democratic Primary Election Candidate for the U.S. Congress 16th District of Texas seat, representing El Paso and surrounding areas. The seat has been held by Silvestre Reyes for the past 16 years. This official campaign photograph is being made available only for publication by news organizations and/or for personal use printing by the subject(s) of the photograph. The photograph may not be manipulated in any way. Paid for by the Beto O'Rourke for Congress Committee.